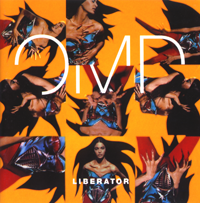 The release of Liberator in 1993 saw a continuation of Andy McCluskey’s desire to keep the OMD name relevant by giving a nod to contemporary trends in music at the time. As with Sugar Tax, Andy was also keen to work with local music personnel. One of these new recruits was PHIL COXON who worked with Andy on Liberator and also joined the band for concert performances. What did you do prior to OMD? I used to be in a local band about six years ago, around Liverpool. Various bands like Here’s Johnny and Jo-Jo and The Real People. Here’s Johnny never really went on to do anything. Jo-Jo and The Real People split up and the two brothers who were running that are currently called The Real People. 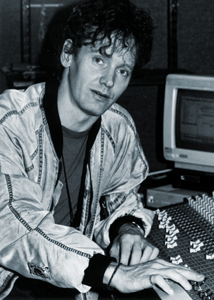 About three years before I met OMD I went into engineering, learnt how to engineer, learnt how to use equipment in a studio. I worked mainly in Manchester because that was the best opportunity I had. The studio owner at Square One offered to help me to learn, whereas the other studios in Liverpool – one was Amazon – you just couldn’t get in to learn, you had to be a tea boy or you had to be well known. So I went out to Manchester. I worked with quite a lot of people and that’s where my main sort of work and my main background comes from. 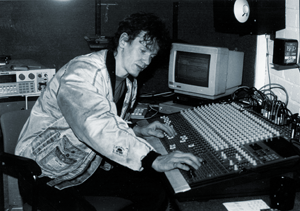 I worked with Paul Young from Mike & The Mechanics, I worked on part of their album. I worked with Melanie Williams, Eric Gooden. You know Melanie from a band called Sub-Sub? I worked with those two for about a year. I worked with a guy from America, Chris Eaton, who did mainly gospel. I mean they were fairly big people and it was great because they really encouraged you. If they thought you had the talent for something they’d just use you, you didn’t have to be a ‘name’. How did you meet up with Andy? I was in Manchester, and my family and a lot of my friends were in Liverpool. I decided I wanted to come back to Liverpool for a short while, so I went to The Pink Museum to do some work and that’s where Andy was, doing some demos and stuff. I met him to actually demo ‘Sugar Tax’ (the track), I started doing some engineering for him and we just got on so he asked me to do some of the work on the actual album which I did. By the time it came to going on tour, I’d had a laugh and we’d been getting on, and they were looking for a keyboard player. I wasn’t going to do it, but with the tour in the air I sort of got this twinge of “Well I used to do this!”, just because I used to like it. It didn’t cross anyone’s mind until one day we were doing the backing tapes and they tried I think it was 20 other keyboard players to do the tour and they hadn’t decided and they were on the last day. Nigel didn’t even know that I played keyboards, because we were only doing backing tapes obviously. Nigel asked me “Can you play?” and I said “yeah” and he said “come on tour man!” and I said “no I can’t go on tour!” and this went on for two days and in the end he had over the phone the guy he was going to use, and he was saying “Please, don’t let me phone him, come on, come on tour with us” until it was right at the last second and I said “OK, I’ll do it”. So then he called Andy, who was in LA at the time. Andy said “Yeah, does he want to do it? If he wants to do it he’s in”. So that was it”. I feel I’m part of what Andy’s doing now, because we’ve worked together a lot for three years or so. I don’t have an influence on what he does, I do what he asks me and he knows what I can do. OMD is something that I liked when I was at school myself. They were a massive band for a long time before I ever started. Paul and Andy’s work together was magical, most of the time. We’ll say nothing about Dazzle Ships! (laughs). That was a partnership that was created when they were both very young, Andy’s worked hard, Paul works very hard to get the fame and success they’ve had. I’m not actually. I am quieter, I am more reserved about people. I mean when a gig’s over and there’s a lot of people outside, I’ll go out and sign something or whatever. But I’m not the sort of person who’ll run around trying to get a lot of attention, I’m not like that. I would much sooner be talking to somebody. The worst thing you could probably do, and I certainly couldn’t do it, is to push yourself on someone and tell them all about you and how great you are, because I think if you deserve recognition at some point you’ll get it. You do have to sell yourself obviously, but if you deserve it you’ll get it. I mean I don’t know OMD fans. I’m learning about them. But Andy’s changed his style of music anyway from what OMD used to be. There used to be a much darker side to OMD which doesn’t appear to be around, it seems to be more poppy now. Whether that’s right or wrong I don’t know. I love the OMD audience you get because it’s so varied, and they’re actually people rather than being screaming idiot young kids or screaming loonies you know! And they’re very, very, very friendly I’ve found. Yeah, I haven’t heard what they’ve said, but obviously if people have disliked them they’ve got to understand. I’ll explain the whole thing: I can do various types of music. I have my own tastes obviously and I must say that most of the remixes wouldn’t be my own personal taste. OMD are not in the American market at all. Except for ‘If You Leave’ OMD haven’t really made it there and one way into the American market is through the clubs. It’s the main way in unless you have a mega hit. I put a beat to ‘Stand Above Me’ which was different, it was much more together and that worked great with the track. But that would have never worked in clubs. So I was asked because of the other things I’ve done, especially with Melanie Williams and Eric Gooden, which was very soul-ey. That’s easy, it’s funky, it’s really good to listen to, blah, blah, blah. OMD songs were never really that easy to remix for the clubs, and if you ask me to remix something for a club, you’ve also got to tell me which type of club. I mean there’s a ‘Sharon & Tracey’ club or there’s a rave club or there’s a soul club or there’s a hip-hop club. There’s different types of styles of music and whatever mixes have gone on the records and the CDs over here, you’ve got to be aware that they’re not the only ones. There’s various mixes that have been done and Andy has chosen the one to go on the record, it’s his choice. He has like four mixes from which to choose which one he wants on the CD. It’s his choice to put it on there. ‘Sailing On The Seven Seas’ had a remix by me, which I don’t think was heard in this country, but that went straight to No.9 in the American dance chart. Yeah I think I’ve heard those remixes. Most of the ‘Seven Seas’ remixes were good. I think the argument those people level at you is with ‘Stand Above Me’, for example, it’s remixed to the point where the original song doesn’t have any resemblance to the remix. ‘Stand Above Me’ was the first track out, it was Andy’s choice. Now I thought it was a good pop song, it wouldn’t have been my first choice as a single, but it went out. Now to get that into the clubs we had a choice of either doing something with that 6/8 type beat which would have gone down in a club like the police turning up! So we had a choice and it was either a four-on-the-floor mix – and how can you put a song to that? you just can’t do it. I mean I tried to get some of the song into that, it just didn’t work and in the end that that wouldn’t go together. So the record company suggested just do something off the wall. So I went away and did something. Phil Kelsey did a remix too. Both of those remixes I think went on the CD, well actually I did two. One of them went on the CD here with Phil Kelsey’s remix, and all of the remixes went over to America to be heard by the Americans. They made the choice what they wanted to put out and they chose mine. Now they put mine out and that mix got ‘Stand Above Me’ and OMD in the American Billboard top 100 for 10 weeks and I’ve got that here in Billboard magazine. It’s got position: No. 6, length of time in charts: 7 weeks. There’s no other way you can get OMD in the top 10 of the Billboard top 100 unless you’ve got a record out and the only way to get that in there is to have a record that people want to hear, and they didn’t want to hear the original ‘Stand Above Me’ straight off like that, because that’s not for clubs. So with doing an absolutely off the wall mix, people were picking up on it and it did the job. ‘Stand Above Me’ was white-labeled first. It was put out as ‘Stand Above Me’ by The Liberator. They thought that if a trendy, hip DJ says “what’s this record?”, picks it up this record, and it’s got OMD on it, it’s very likely he’s going to put it back down. So it was put out as ‘Stand Above Me’ by The Liberator and it worked, it fooled them all. All the DJs were playing all the time. Even the DJs in Liverpool, who got copies of it. I had 4 DJs, because I know quite a lot of DJs, come round to my office in town and say “Yeah, OK, you got us!”. It obviously worked in America too because I’ve got the chart position. So whose idea was that in the first place? It was an accumulation of myself, Andy and the record company – I think in the end they suggested it to us, after we’d already suggested it to them! (laughs). But whoever’s idea it was it worked anyway. The year’s been dominated by dance mixes and I suppose it’s just to keep up with the times. The single is there for the OMD fans. I sympathise for OMD fans that don’t like dance music, that prefer an older style remix where you have the song in it as well, but it’s just trends and in the music industry trends change weekly, and the trend was to have tracks and hardly any song in it, just music. It was hard to tell what was what in clubs. There’d be a great tune on and you found out that it was a remix of ‘My Way’ by Frank Sinatra, you’d never know. It was just off the wall stuff. I mean all that’s turning round again and it’s coming back to slowed down funky stuff with the song in it. ‘Dream Of Me’ – there was six different mixes of that and I loved five of them, I didn’t like one of them, It was a quick, last-minute rough sort of idea and that was the one that went on the CD! What it was, was part of one of the other mixes with a bit of piano plopped over it and looped. Andy just picked up on it because at the time it was rushed and it had to be decided on. But there were a lot of other mixes, one of which came out on ‘Everyday’ which I thought was great, Andy did that. There were a of other mixes of ‘Dream Of Me’ that had most of the song in them, 2 or 3, but like I say, if they don’t turn up on the CD… It’s a choice between the record company and Andy, and even sometimes they will push him into what’s going on in clubs. It’s not being unfaithful to OMD fans because the songs are still there. I do think some variations could be thought about, but it was a plot to try and keep OMD in 1993. I mean U2, they did it, they changed their style completely and went more dance orientated and they’re still here. But they changed their tracks, became a modern band. They’ve lost a lot of their old audience I should imagine, but gained a lot of new people. Andy was more faithful in the way that he didn’t want to change what he’d recorded. He didn’t want to change the actual music so much. But he thought he could do having the actual song and an off the wall remix. If any of the fans had bought the single ‘Everyday’ they’d find that, as I was saying with the trends turning around at the time, ‘Everyday’ has a remix called ‘The Invisible Man Mix’, that’s because there was a television show in Germany and I couldn’t go because I had to remix the track! (laughs). But I mean that has got a lot more of ‘Everyday’ in it song-wise, and it’s a lot slower, not so hectic and not so manic. That’s more sort of the remix that I would like myself, rather than ‘Stand Above Me’, but I thought ‘Stand Above Me’ was good, I kind of liked it and I always thought it was better than Phil Kelsey’s. Not because I don’t like Phil Kelsey by the way, it’s like a self-confidence thing you know, and ‘Dream Of Me’, that was the only remix that I didn’t like. I mean I liked all the other remixes much better, I especially liked the chilled-out stuff, I thought that was really good. There’s bound to be people who don’t like it. I think the problem is that the remixes are a radical departure from the old 12″ mixes and people find that hard to deal with. Personally I think the 12″ remixes that came out of Sugar Tax were a mixed bag. I found some of them good, but some of them I couldn’t get into. I’m not too keen on ‘Stand Above Me’, but I liked the Invisible Man mix of ‘Everyday’ which is funny because I wasn’t keen on the original track! Obviously you do something you think people will like and you’ve got to be happy with it yourself. But it’s not like a factory turning out rubbish just because of this, or just because of that or tailor-made music. You’ve just got to cater for a wide audience and sometimes it’s right, you put variations on the record and people will like the whole lot, or some people will like this one and some people will like that one. There’s bound to be people who don’t like something, and I’m sorry for the people who don’t like it, it’s just you’re trying to cater for today and keeping up with the times and remixes have changed, it’s the way it’s gone. It’s changed and you have to change with them, you’ve just got to. Trying to open up the market and keep OMD in full use sort of thing. It’s not cold toward OMD fans, it’s just trying to keep everybody happy. But old style remixes, I used to love Jolley & Swain – worked with Alison Moyet – brilliant 12″ mixes. The best people I ever worked with showed me about remixing and about 12″s and stuff. They’d just put the track in and then they’d just extend the track, by putting an extra piece of music in between the verses or the chorus or extending the chorus or have the beat drop down a bit or whatever. I mean I do like that, that’s more like what it’s come back to and ‘Everyday’ is more like that. OMD have been trying to crack the American market for a number of years now, so I guess that’s one of the ways to do it. Some of these club mixes are quite good. Who actually did that ‘Apollo XI’ club mix that cropped up a few years back? I’m not sure. I did a mix of ‘Apollo XI’ which was actually more laid back than ‘Apollo XI’, it had all the melodies and stuff in it and it had all the voices. It was more ambient, if you like. But I don’t know if that’s the one you heard. I don’t think it was ever pressed up. I think it was only ever on DAT. I heard the original ‘Agnus Dei’, and although the one that was released on Liberator is good, I preferred the original. I heard the original ‘Agnus Dei’ and there were quite a few changes to ‘Agnus Dei’ in the studio, I can’t remember why. But I mean the thing that came out in the end, there were two mixes: there was a mix by Andy and there was a mix by me and they were both pretty much the same as the demo because the demos are used as a guideline for most of the album. I think the actual finished version is about 16 different pieces all cut together. I haven’t heard the original demos for quite a while, I heard ‘Dollar Girl’ demo the other day, by accident! (laughs) and that was vastly different from the one on the album. The impression I got from the one on Liberator was that it had been toned down. When I heard the demo it was more ‘in your face’. Was it faster, the demo? Yeah, I remember now. I think Andy had a worry about it being too fast and he wanted to slow it down. he had a worry about it being too fast and too ravey. Because he was happy with the original and I was as well and I think when we were in the studio he was worried about it being too fast, and I think the culprits for putting that fear into his head were the record company advisors from the dance department who seemed concerned that really fast rave was out now. Moving on from that, outside of OMD are you pursuing any other projects? Oh yeah. Before the album started I did a few bits and pieces with Oceanic, but solidly since August I’ve just been working with Andy. The tour’s coming up and I’ve moved house, so I’ve had about two weeks just spent decorating! (laughs). But as soon as the tour’s finished, at the start of next year, I think we’ve got a bit of work in January, but at the moment I’m trying to put together a plan. I’ve got a couple of nice projects on, one which I’d like to take care of after the tour myself, which is a new artist – a singer – I’d like to get a few more tracks together with her. Stuart’s spoken to me already about doing a couple of records, there’s some interesting ideas about what we’d like to do. Because Andy will just go away and he’ll come back with what he wants to do next year. He’ll have a DAT of ideas about the direction he’d going. I think he’s probably going to change it slightly, I’m not sure. I’ve got a different style of music in me which is where my roots are, which is like Motown and soul stuff. Do you have a favourite OMD song? I actually love ‘Joan Of Arc’, but one of the first OMD tracks that I ever liked was ‘Messages’, and I also liked ‘Souvenir’. 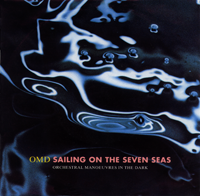 From the newer stuff: I liked ‘Pandora’s Box’ and I like ‘Best Years..’ If I’ve got to give you my ultimate track of all time from OMD I would say ‘Dreaming’. My favourite live song is ‘Dreaming’. Finally, what music do you like to listen to at home? I listen to all sorts of music. I listen to Peter Gabriel, The Who. I like Crowded House – I liked the last album. My musical tastes, listening-wise are so varied, because if it’s good – I like it. Original interview by Paul Browne October 1993. Photos by Neil Taylor.